Today has been challenging, overcoming fears and obstacles that we have had to face. We went underground exploring caves. Most of us were nervous about the little amount of space we had. Once we travelled further into the cave, we discovered another challenge: deep water. 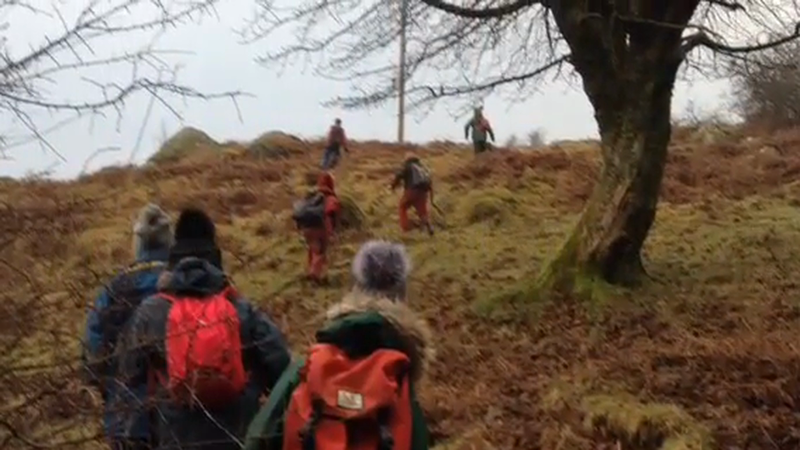 If we were not careful, then our wellies would overflow with freezing cold water. To avoid the water, we had to use a method called bridging. We had to push an equal amount of pressure on each side of the rocks and pebbles, to stop getting soaking wet. We tried lots of different caves but when we became a bit more confident, we were set another challenge. The challenge was to turn all of our torches and headlights off so that we were in pitch black and couldn't see anything. We all queued up before turning the lights off; we had to feel everywhere we went - trying not to bang our heads on the wall. For this, we had to crouch in the tight spaces. 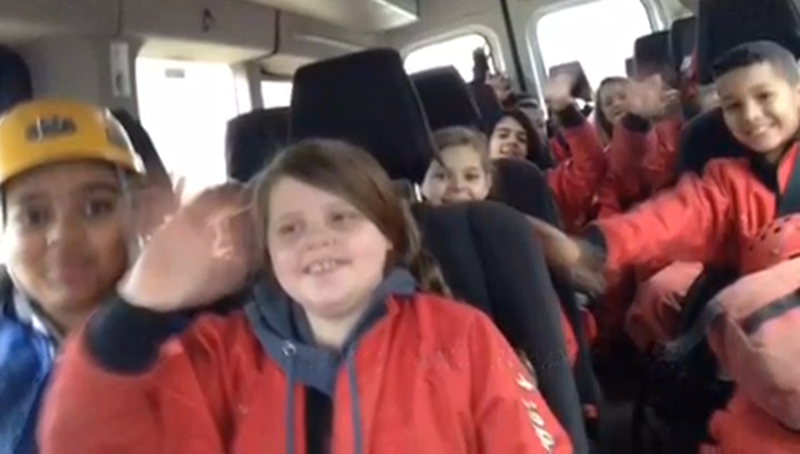 As we felt that we were becoming braver at caving, we all went into another cave without the instructor or Mrs Wilson. To do this, we had to work as a co-operating team, making sure no one was left behind. We all felt nervous as we only had each other to get through the cave. But, before long, we realised that it was possible, as long as we worked together. The funniest moment we had was when we were coming to the end of the cave. As people started to shout back to others "daylight," (for we made sure we told each other what was coming up, so that we stuck together and no one got scared) Ryan began singing Ave Maria. Everyone started laughing as the song echoed through the cave. It was a great day, full of challenge and achievement, for all of us. Today we have been canoeing, rock climbing and zip wiring. We had so much fun in all the activities, it's difficult to say which one was the most exciting. Zip wiring was awesome: adrenalin was pumping through me as soon as I let go. It was as if I was a bird soaring through the sky. Some people faced some of their fears on the zip wire today as there were a couple of people in our group that were scared of heights. As a team, we did our best to encourage them and felt proud of them when they were brave enough to take the steps up to the top of the tower and jump from the zip wire. Well done Tia, India and Kian. Then it was on to rock climbing. That was really good - we climbed so high in the sky, the views were great. However, that meant coming down was a bit scary. 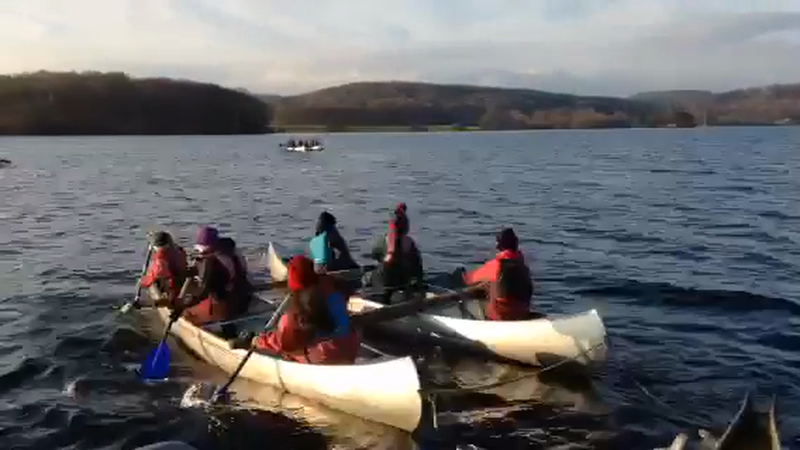 In the afternoon, we had the chance to canoe in England's largest lake: Lake Windermere. We canoed across it and saw some beautiful views. For this we made a super group (Mrs Wilson's and Mrs Freeley's), where we joined together to build 4 rafts with the canoes. Then we split up into the rafts and had a race to the other side of the lake. This was really fun, everyone was laughing and smiling, but tough at the same time. If you paddled to hard on one side the raft kept spinning around in circles. This happened a lot to begin with. Then we realised how important it was to co-operate and listen to each other. So we started shouting thing like "one, two" or "in, out," to help us row together. This really helped and meant we made it to the other side, where we got to do challenges and competitions in the rafts, like racing to different point, rowing backwards and even standing up. We were out so long the sun nearly set before we got back to the jetty. Tonight, we are having a ghyll head talent show that more than 10 acts have signed up for. Lots of us are nervous but excited about it. We can't wait to so all the amazing acts, not to mention the presenters: Ant (Cher), Dec (Emma) and Melissa. Overall it was a really good day and I would recommend it to everyone. Today I had the most fun I've ever had. First, we climbed the climbing wall and I was a bit nervous to climb it because my boots were muddy and I felt like I'd slip . Then we did the rope course and I fell so many times getting super muddy and cold because I wasn't wearing gloves . Next I did the zip line because I wanted to prove that it wasn't scary and it was fun . It was super high but it was extremely fun and when I jumped there was a rush of adrenaline passing through me. We then had lunch and went canoeing . At first we were slow but we got very fast . I love it at Ghyll Head.